When a corporation or limited liability company from one state begins to do business in another state, often the first requirement is to file an Application for Authority with the corporate registry (usually the Secretary of State). What constitutes “doing business” can be a tricky question and if the company is not sure whether their activities would be considered doing business in a given state, an attorney or CPA familiar with the business and proposed activities of the company can help to determine this. In addition to this registration, there are likely to be other registration obligations the company must meet in order to be compliant. In addition to licensing that may be required for companies engaged in regulated activities, such as insurance producers, mortgage brokers or collection agencies, there are basic tax registrations and may be general business licenses which can be required, especially when the company has a physical location in a given state. While most states require corporations to pay taxes on their income, a separate registration for the payment of this tax is not always required; the corporation just needs to file a return. In certain states, however, a corporation does need to submit an initial registration statement. The rules for limited liability companies vary greatly from state to state and registration is often required for them as well. States that require initial registration for corporations include: Connecticut, Illinois, Massachusetts, New Jersey, Virginia and Washington D.C. To ensure compliance, it is important for a company to consult a CPA or accountant to determine whether or not it needs to register to pay franchise or income tax in a given state. 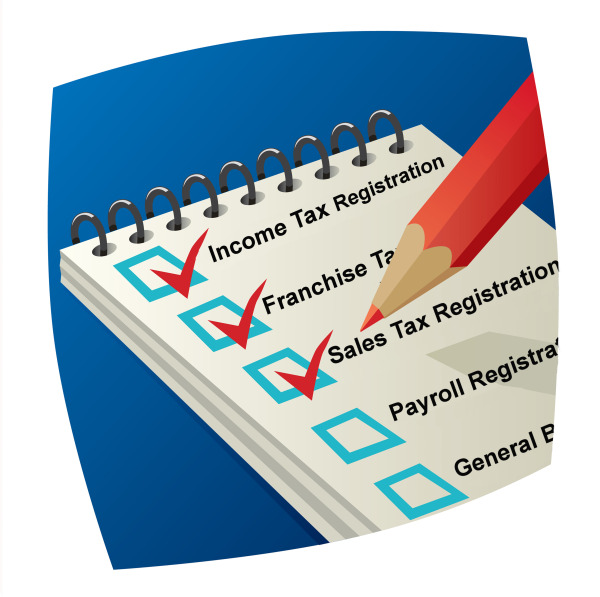 In every state that charges sales tax, a company that is located in that state and is selling taxable products or services will need to register. (There are only six states which do not have sales tax and most of those have other taxes, such as excise tax, gross receipts tax, etc.). Even when a company is not collecting sales tax in the course of business, the registration is required to obtain a Resale Certificate, which allows for tax-exempt purchases of products that will be re-sold in the course of business. In some states, such as Colorado, Florida, Georgia and New Jersey, to name a few, a separate registration is required for each location within the state. Note that even if the company does not have a physical location in a particular area, they may still need to register for sales tax if it is determined that they have nexus there. Consultation with an attorney or CPA is recommended. If a company has employees, they will need to register to withhold certain taxes from their employees’ paychecks. Unemployment withholding and worker’s compensation withholding are required in every state. Certain states also require businesses to pay for temporary disability insurance. These states include California, Hawaii, New Jersey, New York and Rhode Island. There are a few states which have a general business license requirement where the application is filed with a state agency, such as Alaska, Delaware, Nevada and Washington. It is much more common, however, to find these requirements at the municipal or county level, so the physical location of the company within the state plays an important role. Some jurisdictions have “Home Based Business Licenses” which could apply when a company does not have an actual location in a particular municipality but does have an employee working from his or her home. As state, county and municipal governments seek to increase revenue for their states, enforcement of licensing and registration requirements has gotten stricter. It is in a company’s best interest to be aware of and ensure compliance with all requirements when beginning business in a new state or location.